Check out our videos on our YouTube channel . Stalk Benders are manufactured in the USA and are being used primarily in the Corn Belt of the United States. They work with any type of standing stubble, but are designed for corn stalks. The simplicity of the torsion spring and T bar are our main competitive advantage in reducing stalk tire damage. The Stalk Bender™ is ideal for almost any field operation as the equipment protects tires and tracks, while easily passing between rows of growing plants. Stalk Bender is a simple attachment mounted in front of the tire or track to bend (or lay) stalks in the direction of travel as you pass over them instead of driving into them. This simple motion significantly reduces the impact on tires and tracks, saving wear and tear on the tread, and extending the life of the tractor tracks and tractor tires..
As the Stalk Bender™ pushes the stalk forward, the stalks do not break off. Farmers who have used other models of stalk smashers and stalk rollers and switched to ours have commented on how little trash breaks off while using the bender. This is due to the fact that the Stalk Bender™ is designed to bend or lay stalks over, rather than breaking and fluffing the residue in a manner that fills the air surrounding the tractor with debris...providing a cleaner, safer, and more ideal environment for both the operator and the equipment. The unit attaches to the frame one to three feet in front of the tire with a height of four to five inches from the ground. The unit uses a torsion spring principle to absorb the impact of the stalks, bending the stock over in the process.. The patented design features T-Bars the same width as the tire and gently pushes corn stalks forward just prior to making contact with the tire or track. 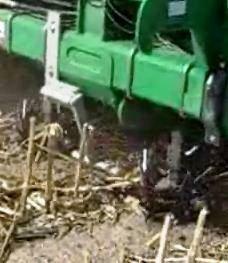 In turn, reducing the abrasive action of unprotected equipment running over tough corn stalks. The Stalk Bender™ does not touch the ground. The goal is to bend the stalks, not to pulverize, crush, smash, shred, or snap them off. This action is a stalk bender, not a stalk stomper, corn knocker, stalk pusher, stalk smasher, stalk shredder, or stalk pulverizer. The Stalk Bender™ passes easily over sprinkler tracks. We do not recommend our current models for fields with washouts greater than 18 inches deep, where the entire front tire is likely to fall in, or vertical walls greater than 18 inches. No need to change settings at the end of every field pass, as the Stalk Bender™ remains in the same position during all operations: in the field; end row turns; or when roading the tractor. When going in reverse, the stalk bender does not need to be adjusted or raised from the ground. When not needed, it only takes one person a few minutes to loosen the set bolts and flip the lightweight bar over to the storage position and continue working, which allows the units to be repositioned to full operational mode just as quickly and easily. No hydraulic cylinders or hoses to mess with. No stands or storage space needed.